Having had a hectic couple of months, I’m looking for some quiet time, away from the din and packed tourist spots. And so, I head off to the place where Rudyard Kipling sat to pen chapters of Kim. Bundi — about a three-hour-drive from Jaipur — gets its name from a Meena chieftain of yore. It is not a destination for the indulgent traveller, nor is it a place for those looking for adventure. It is simply the town that takes you back to a simpler time so tranquil, you forget the world you’ve left behind. Quite like reading a good book. “You know Mowgli?” my guide asks me. “His creator Kipling said that the city’s fort was made by angels.” Each guide will reiterate this line, as though it is the slogan of this minuscule town. But tourists aren’t seen here too often. Bundi is, I discover over the course of two days, the hidden gem of Rajasthan’s royal destinations. And our first stop, secluded and far off in the hills, is the Bundi Palace. We undertake the steep climb, with not a soul in sight save for two stray dogs wagging their tails. The majestic Hathi Pol (Elephant Gate) welcomes us into the towering castle, the wrought iron doors between intricately-carved pillars left wide open. Even in the pleasant January chill, when the desert state is usually teeming with festival-goers and wide-eyed Indophiles, there is no one around. And that is the beauty of Bundi — it is all yours to explore at your own pace. We walk into the palace and are greeted by an unkempt bush, and paint peeling off the walls. Despite these age-old ruins and the smell of bat and pigeon droppings permeating the area, the royal abode is a sight to behold. You’re immediately transported to the 15th century, with its history laid bare, on frescoes on the walls. The marble seat for the king under an intricate canopy in the diwan-e-aam provides for a great photo-op, before you walk on ahead towards the spiral staircases that lead to a world of magical artworks. 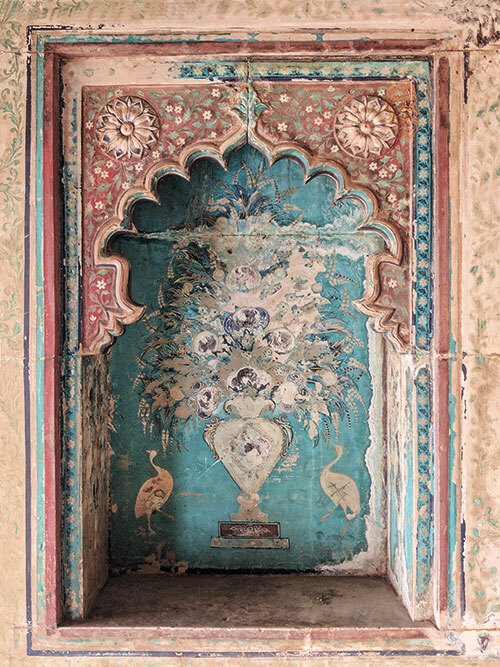 The Badal and Phool Mahals — rooms which are normally closed but we get permission to unlock — are adorned by murals on the walls and ceilings, reminiscent of Rajput and Mughal art yes, but the Chinese style too; thanks to the influence of Oriental painters at court. Here, I stand gaping at the pictures, each one telling a different story. Reds, blues and greens — made from natural dyes — are predominant in these 370-year-old creations, and though they remain uncared for, their resplendence hasn’t faded. It’s like walking into the pages of history, mythology and fantasy all at once. 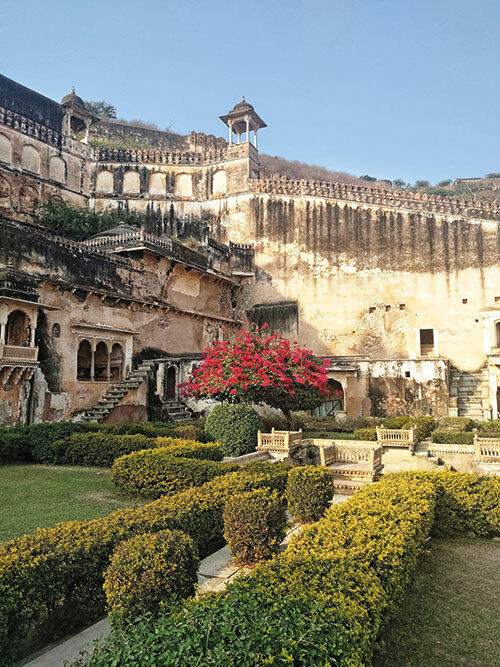 Bundi may be stuck in a time warp, but we aren’t complaining. “This is actually the second most beautiful place in the palace, you haven’t seen everything yet,” Billuji the guide tells me. And how right he proves to be. Through a secret trapdoor one spiral staircase away (the normal route is a 20-minute climb), we enter Ummed Mahal. The only section of the erstwhile royal building to be maintained by the Archaeological Survey of India (ASI) and hence in better condition than the rest of the rooms, it houses a gorgeous garden which instantly reminds me of a Mughal charbagh. I spend a few quiet moments here, admiring the floral bushes but wary of the monkeys hopping around nearby. (“Don’t worry, they are your friends and won’t harm or steal,” I am assured). 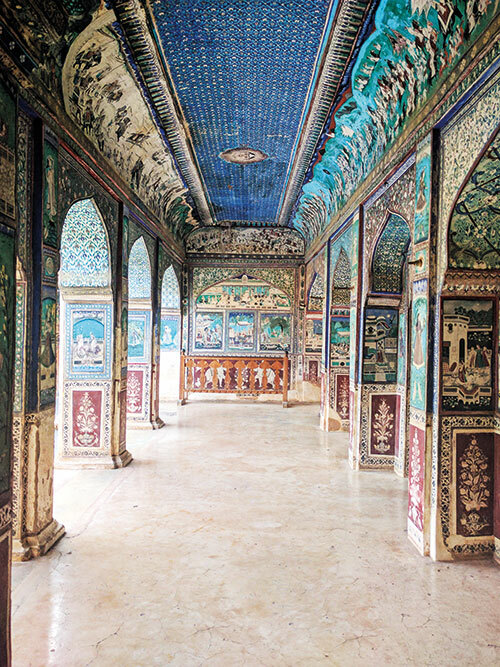 Crossing the green, we enter the Chitrashala, Bundi’s school of painting and inarguably its crown jewel. 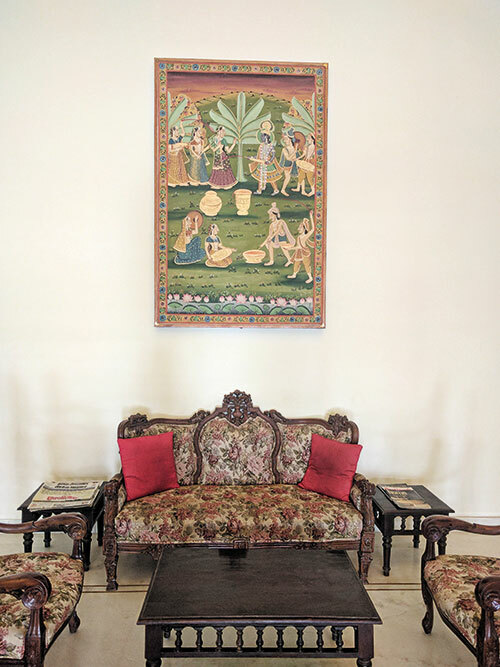 The artworks here — in mellow blues and greens with touches of whites and yellows — tell tales of court and zenana life, stories from the Ramayana, and there’s even an ‘Indian Romeo and Juliet’, with a young courtier serenading a woman at her balcony! With Billuji explaining the significance of every frame, I spend over 30 minutes in this quaint gallery, discovering the secrets of the Raos, the rulers who built the Ummed Mahal. Stand close to a fresco and you can see the detailing on the jewellery and clothing of the queens; view the same from afar and you notice the three-dimensional aspect of the scenes. Bundi was the only royal Rajasthani household that didn’t shy away from portraying women smoking hookahs and playing games — considered immoral at the time. Walk around all you will, it will never be enough to appreciate the intricacies of these compositions. We head back to our home for two nights, the largest hotel in town, named after the region it’s situated in. Hadoti Palace is, after the Taragarh Fort and the Bundi Palace, probably the small town’s grandest venue. The old city is about five to seven kilometres from end to end, and contains mostly small guesthouses and havelis-turned-into-hotels that play host to travellers. Our hotel — owned by the royal family of Badnore who trace their ancestry back to the warriors of the Mughal era — is situated right in the city centre. 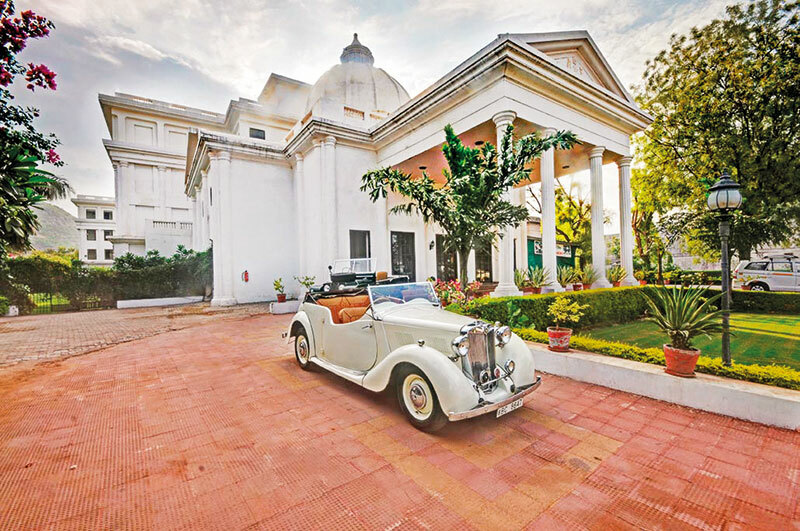 Avijit Singh, owner of the locale and like many of his ilk, a lover of vintage cars, takes me around the property, painted in a pristine white that stands out among a sea of blue and yellow houses. Forty-three rooms including seven palatial suites, all with top-of-the-line amenities, make it a hub for those who aren’t looking to rough it out. Started as a two-storey hotel by the family less than a decade ago, the owners added a third floor to the building just a short while ago, owing to a spike in visitors during tourist season. In the lobby, a grand chandelier sits above our heads, while glass windows give us a peek into the family’s envious collection of vintage automobiles. “I used to take my cars for a spin occasionally, but with the bad roads now, I don’t risk it!” explains Singh. After a scrumptious meal of dal, rice, spicy chicken and buttery naan, we sit in the poolside garden, with the cold evening breeze for company. As Singh gets busy in his work, I lose myself in my copy of Kohinoor, all the while thinking of the palace I spent the afternoon in, its illustrious paintings still etched in my mind. And back in my pool-facing room at night, I look out the window to find in the distance, the Fort, Bundi’s pièce de résistance shining in the moonlight. Like the Mughals who once owned the prized jewel I’m reading about — and who also staked claim to a large part of Rajasthan — I too am in awe of what I discover in hidden corners of this country I call home. Morning brings with it a delectable breakfast of puri bhaji and piping hot parathas at Taragarh, the hotel’s lone restaurant that also offers several local and continental dishes — a band of French tourists gossiping in hushed tones provides background music for my solitary meal. Of course, Bundi is also known as the City of Stepwells, due to the large number of baoris it is home to. The Raniji Ki Baori and the Dabhai Kund are spectacular in their architecture; the geometric layout of the steps creates optical illusions that make for many an arresting photograph. Kipling’s temporary home Sukh Mahal, on the banks of the Jait Sagar Lake, and the sunset view of the grand palace in the Nawal Sagar Lake are also pleasant sights in this quaint land. We end our trip with a nighttime visit to the brightly-lit Chaurasi Khambon Ki Chhatri or 84-pillared cenotaph, built in the 1600s by the ruler in memory of his wet nurse. Try as much as you will, counting all the pillars seems an impossible task (until you’re told the secret of the hidden pillars). But if you’ve left your heart behind in the painted rooms of the city palace, even these glorious sights fade in comparison. Such is the beauty of uncovering the unexplored, that the contents of a small room in the corner of an abandoned palace can suddenly take over your imagination, mesmerising you for days. Even though they haven’t really been created by angels.